I have been enjoying school visits for the past 15 years. I’ve played a role in great successes and I’ve had visits that have felt flat and, for me at least, unrealized. Same guy. What was the difference? Here’s a clue: I don’t think it’s the author. I’ve given talks when teachers have walked into the room enthusiastic and eager — curious to meet me, to hear my talk — and I’ve seen teachers arrive late, who appear put-upon and vaguely annoyed. They flip through papers, check their watches, see it all as an inconvenience rather than something germane to their mission as teachers. Students feed directly off those attitudes; it’s what they are taught. I’ve seen kids enter a room bubbling with excitement. I’ve seen it in their eyes. They were going to meet a real, live author. Someone whose books they’ve talked about and read. Other times, other groups: it’s more like, “Why are we here again?” They may not even be sure. Here’s what I’ve concluded: A school visit isn’t something that happens to a school. It is something that a school does. Authors don’t “do” school visits. It’s an important distinction. An author visit is not passive for the school. It’s active. And it requires a lot of work, with a lot of different people pulling on the same oar. Schools make these visits happen — and by “schools” I mean the principal, librarian, teachers, service workers, and PTA/PTO. The author showing up? That’s after most of the real work’s been done. At least 85% of what transpires for a visit is up the school, not the author. In fact, it’s not that much about “the event” itself, which happens in a flash and is soon over. A small part of a given day. The author comes and goes. Then it’s P.E. and lunch and recess and the math quiz. What endures is what happens in the school before and after the visit. For an author visit to make sense, it has to be part of some greater context, a school’s emphasis on literacy, it’s fundamental belief in the value of reading and writing. The author is part of something much larger. Or else, seriously, don’t bother. Save the money. 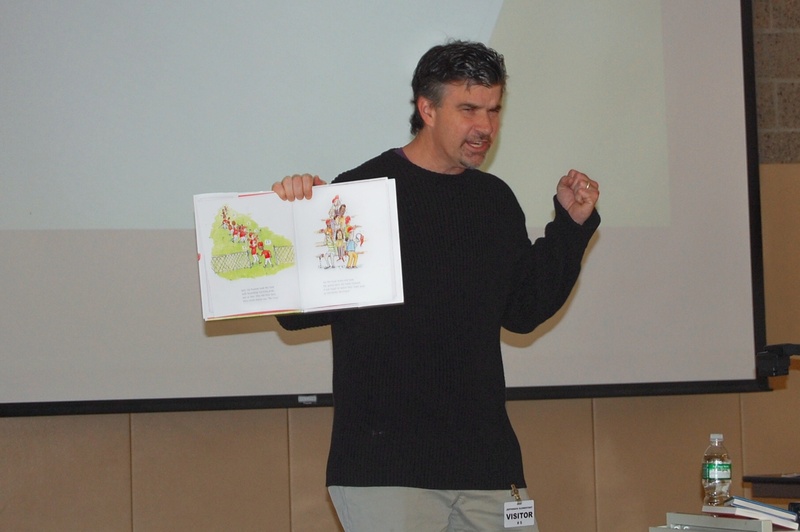 Schools should think of a visiting author as a distant uncle they’ve invited over for Thanksgiving dinner. They’ve been preparing, shopping, cleaning, and cooking long before Uncle Jimmy ever shows up. Sure, he’s funny and nice and will add to the festivities, might even help make it a wonderful afternoon. But without all your work — if there’s no turkey! — then it’s not going to be much of a visit. And guess what? Uncle Jimmy isn’t going to hang around to do dishes. He won’t be eating the leftovers either. What you get out of an author visit is in direct proportion to what you put into it — just like everything else in life. * Visiting Authors Dot Com — lots of good stuff here, start digging.